Traverse City Police Officers Howard Munsen, Howard V. Ritter, Harold Culman, August 1946. Image #720.091707.202-4, Traverse Area District Library Local History Collection. Police Chief Howard V. Ritter dies at 54. Chief Ritter was born July 19, 1913 at Rapid City, and moved to Indiana with his parents where he attended school. He then moved to Traverse City in 1930 where he graduated from Senior High School. After graduating from County Normal School in 1933, he taught school for a number of years in Kingsley. 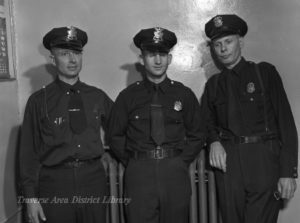 In 1942 he joined the Traverse City police department as a patrolman, and was appointed chief in 1966. Mr. Ritter was and active member of First Nazarene Church, serving as chairman of the board of trustees, as treasurer, and as a member of the building committee. He was also a member of the local chapter of Youth For Christ, was a past president, secretary, and treasurer of the Fraternal Order of Police, served on the local Boy Scout board of review, and was a Boy Scout leader. Capt. John McCloskey is expected to be certified as the new chief of police. Romney visits India. Republican presidential hopeful George Romney discussed food production and birth control with Indian governmental officials. He was told that although India was sympathetic with America’s cause in Vietnam, they were unable to lend active support as a matter of survival. Home for the Holidays. Misses Brenda and Joann Duff, daughters of Mr. and Mrs. Keith Duff of Buckley, are visiting their family for the holidays. Brenda (Biederman) has just returned from a trip to South America, and will work in San Francisco, California after the holidays. Joann will return to New York City where she is employed by the United Nations. With U.S. 7th Fleet. Airman Larry D. HIll, USN, son of Mr. and Mrs. Herbert R. Hill of Acme, is serving aboard the U.S. Seventh Fleet attack carries USS Kitty Hawk off the coast of North Vietnam. At the Eastfield Thriftway Market: Pork Roast, 49￠ lb; Chuck Roast, 59¢ lb; Morrell”s Pride Purt Shortening, 39¢ for 3lb., Bacon 33¢ lb, 2-lb Pkg. of Nestle’s Quik, 65¢. Miss Hildah Cummings, 69, of 422 Washington Street, Traverse City, was pronounced dead on arrival at Munson Medical Center Saturday after an apparent heart attack at her home. Miss Cummings was born September 30, 1898, at Lake Ann, the daughter of Henry and Ada Cummings, a pioneer family in the Grand Traverse region. Miss Cummings later lived in New York and Detroit, retiring from the YWCA organization in 1965 and moving to Traverse City to make her home. She will be interred in Grand Traverse Memorial Gardens. At WTCM Station: Traverse City Chapter of Sweet Adelines will hold its practice Wednesday night at the WTCM Radio Station instead of the regular Monday night rehearsal. Members are invited to attend a social hour from 8 to 9 p.m. to become acquainted with the new members. Movie poster courtesy of Wikipedia (source unknown). In the movie theater on this day: “More Than a Miracle” starring Sophia Loren and Omar Sharif. Dare-All Squares Square Dancing Club will dancxe Friday evening at 8 p.m. at the Garfield towhall. Darrell Figg will be the caller. All western style square dancers are invited and memers are reminded to bring sandwiches. Quints born in Australia. Australia’s Braham quintuplets weighed i a more than three pounds each today, and doctors say the three girls and two boys are doing well. They were Australia’s first surviving quints. Half of the world’s present population has been born since World War II as of this date. Newspaper comics of the day: Mary Worth, Buzz Sawyer, Rip Kirby, Blondie, Snuffy Smith, Dr. Kildaire, Donald Duck, L’il Abner, Henry, Muggs and Skeeter, Beetle Bailey. Previous PostNew Biography of Jens Petersen reveals life of bold, innovative architect of Traverse City pastNext PostDepression-Era Scrip Stamps? It’s a mystery!